"OH I DO LIKE TO BE BESIDE THE SEA-SIDE"
Mid-Ulster Ladies's second match of the season took them to the sea-side to meet Tollymore Athletic, the Newcastle side had made a good start to the season so the girls expected a tough game and were not disappointed. The Mid-Ulster girls started brightly and put the home side on the back foot right from the kick-off, with Laura Burton and Stacey Hodgett forcing the Tollymore keeper to pull off some tough saves. The Mid-Ulster girls began to dominate, with Clare McGrath, Pamela Bates, Julie Kirkpatrick and Michele Derby controlling the mid-field, and inevitably it was from here that the move for the 1st goal started. box. Laura kept her cool and lobbed the ball over the onrushing Tollymore keeper. The Newcastle side fought back strongly and with both sides playing so well, it provide an extremely entertaining game for the spectators. Tollymore switched their tactics and played long balls over the Mid-Ulster back line, hoping to optimise on the speed of their forwards, and it was this tactic that won them the corner that lead to their equaliser. the ball creep over the goal line. 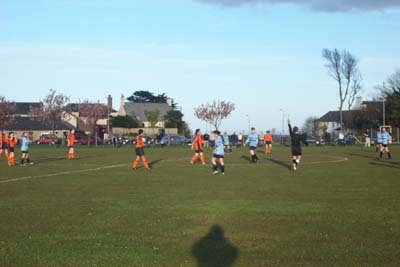 The second half started with the same high standard of football, but the defensive displays of Natasha Stewart, Elaine Junk, Karen Stirrup and Ruth Brown could not be questioned, and it was their outstanding play that denied Tollymore any further goal opportunities, except for the occasional set piece. Tracy Bell again had a good game in goals, but with few saves to make, she demonstrated her footballing skills by providing an extra option for her defenders. Early in the second half coach, Noel Mitchell, made a few tactical changes replacing sweeper Elaine Junk with Heather Hunniford, Julie Kirpatrick with Judith Black and Stacey Hodgett with Oonagh McCann. The versatility of the MU squad was clearly demonstrated with these changes, as the team far from being disrupted by the changes continued to play some very creative football, with Oonagh McCann and Judith Black coming close to giving MU all 3 points on several occasions. First point of the season for the MU girls, who celebrated with a quick dip in the Irish Sea, well they were on their holidays !!! !, and they hope to continue their progress when they meet Armagh in their next match at Fairhill, Cookstown on Thursday 9th May.